GIS Technicians make maps, customized GIS applications and manipulate data that proves to serve for various purposes. 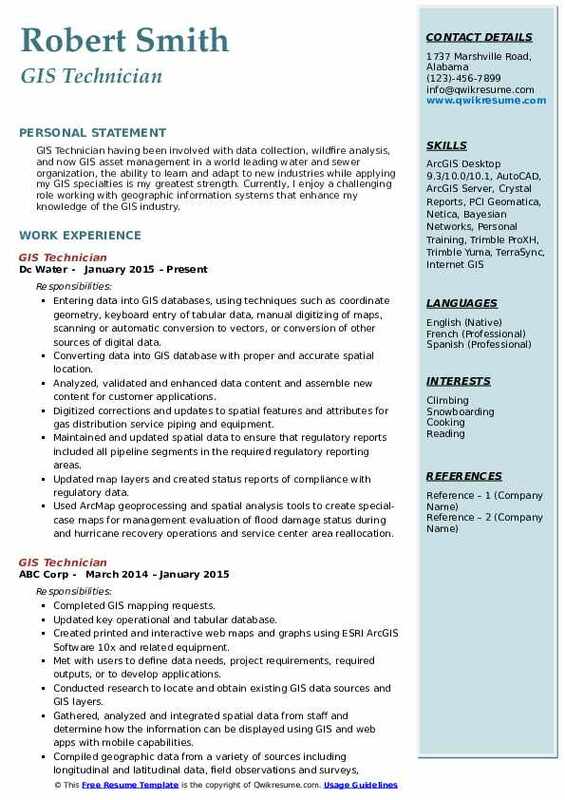 Most of the tasks of a GIS technician is job-based, but the following roles and responsibilities are commonly seen on a successful resume – reading and interpreting maps, manipulating and understanding digital land data, managing GIS database, using huge range of GIS tools, creating and maintaining structure needed for GIS data storage, analyzing and presenting geographical information; and creating data reports. Successful GIS Technicians should have strong attention to details as the job role entails frequent handling of data, they should also have an outstanding oral and written communication skills and be able to train people on how to effectively use GIS technology, GIS Technicians must be proficient on GIS programming. 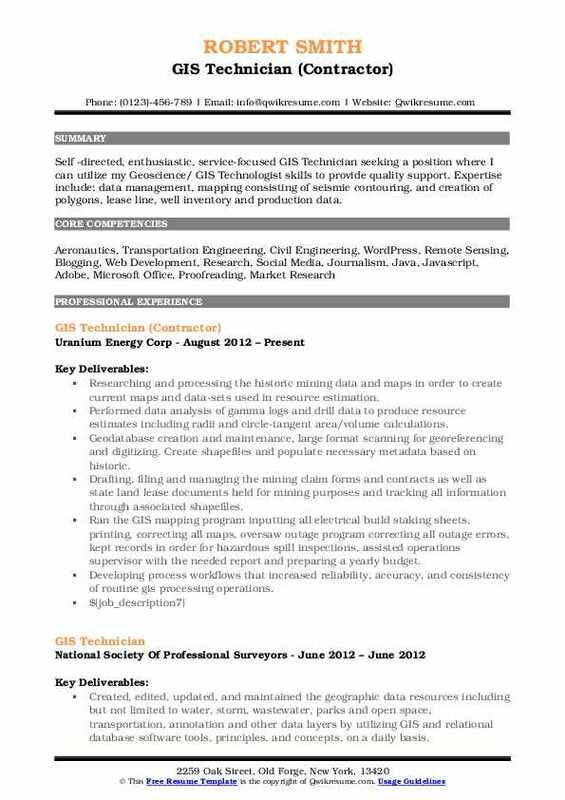 GIS technician resume typically contains a University degree in Geography or Geophysics. 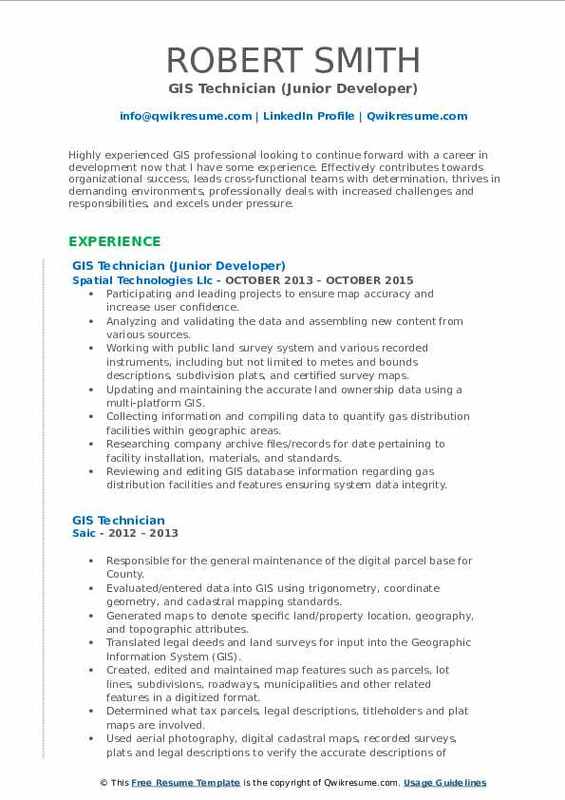 Summary : GIS Technician with over 7 years of experience. Seeks challenging position in geospatial data management and analysis. Excels in fast-paced environments and has a keen attention to detail. Possesses strong communication skills and creative problem-solving abilities from previous work and volunteer roles. Proficient in ArcGIS and ArcGIS Online software. Personal interest in data quality, web mapping, and database maintenance. Established, maintained, validated, enhanced expanded municipal gis for all departments. Produced maps, data entry forms graphics to support municipal projects, including field maps, contract documents, and official records. Drafted proofread various documentation, grant applications, and correspondence. Managed scheduled updates to local databases, including establishing maintaining a distributed GDB connection to the county GIS depts parent replica for integration with cross-platform use. Coordinated interdepartmental mapping projects for the planning zoning and public works engineering departments, as well as for municipal police, board of supervisors, and administrative officials. Planned performed annual sidewalk inspections in support of the municipal policy. Prepared data matrices, graphics maps to comply with ms4 annual permitting requirements, including an initial inventory of BMPs and the acquisition of necessary supporting data for the township engineer. Performed spatial analyses on tax parcel data to calculate annual street light fire hydrant assessments for the municipal tax office. Established street tree inventory mapping database management systems. Summary : Senior GIS Technician seeking a technical management IT position that utilizes my vast experience in engineering, scientific and business development projects in a collaborative, progressive and professionally enriching environment. Strong technical writing, communication, and management skills. Certifiable record of successfully completing projects through individual thinking and collaboration. Designing, developing and maintaining SDE, file and personal geodatabases for underground utilities. Activities included vectorizing utilities and creating attributes from as-built and construction raster imagery. Supporting the office of information technology in standing up independent servers for utility data. Includes coordination with multiple stakeholders and consultants to transfer and/or replicate data from remote servers to centralized archives and verify data integrity. Developing and beta test application software customized by consultants and vendors to verify the accuracy of field inspected conditions and verify the precision for metadata documentation. Advising and directing contractors/consultants and most staff on database management/replication and process improvements strategies. Developing quality control and quality assurance methods to ensure data integrity/accuracy for consultants and contractors actively engaged in major land development projects. Coordinated IT programming for location-based system analysis using real-time GPS for data acquisition. Design, develop and maintain SDE, file and personal geodatabases for underground utilities using ARCFM activities included. Summary : A seasoned professional with experience working on GIS and Cartography projects. Proficient in diversified skills, including administration, management, and technical applications. Seeking to align recently acquired academic credentials and professional objectives with a position in the Geospatial Industry. Gathering, analyzing, and integrating the geospatial data to locate and obtain existing databases. Compiling the geographic data from a variety of sources including census data, and existing maps. Analyzing spatial data for geographic statistics as well as incorporate data into documents and reports. Providing spatial data to management for use in project related decision-making. Performing data analysis on field collected datasets to ensure high-quality deliverables. Designing and updating the databases, applying additional knowledge of spatial feature representations. Creating and customizing the geodatabases and their feature datasets in ArcCatalog. Creating new maps using the principles of cartography including coordinate systems. Analyzing the geographic relationships among varying types of data using excel. Experience with efficiently allocating responsibilities and prioritizing tasks while meeting deadlines. 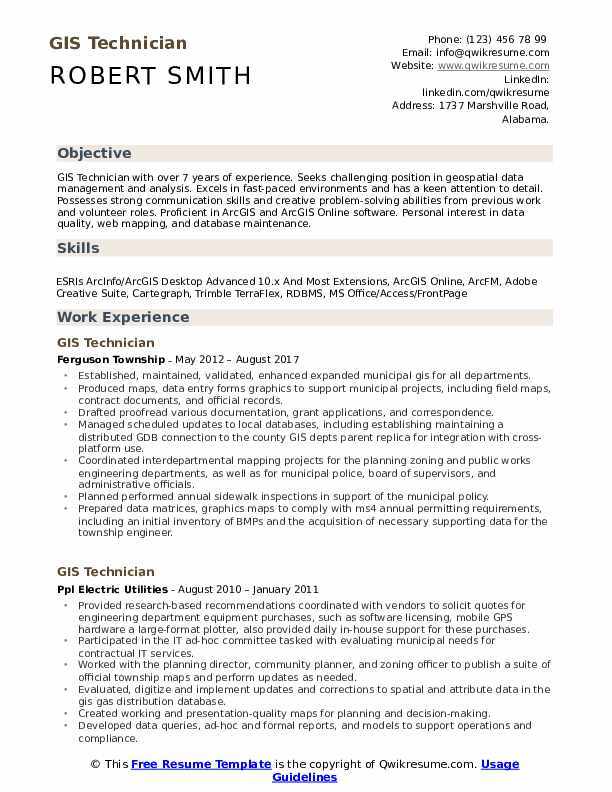 Objective : Highly experienced GIS professional looking to continue forward with a career in development now that I have some experience. Effectively contributes towards organizational success, leads cross-functional teams with determination, thrives in demanding environments, professionally deals with increased challenges and responsibilities, and excels under pressure. Participating and leading projects to ensure map accuracy and increase user confidence. Analyzing and validating the data and assembling new content from various sources. Working with public land survey system and various recorded instruments, including but not limited to metes and bounds descriptions, subdivision plats, and certified survey maps. Updating and maintaining the accurate land ownership data using a multi-platform GIS. Collecting information and compiling data to quantify gas distribution facilities within geographic areas. Researching company archive files/records for date pertaining to facility installation, materials, and standards. Reviewing and editing GIS database information regarding gas distribution facilities and features ensuring system data integrity. Keeping an up to date and accurate GIS database of all main and service natural gas lines. 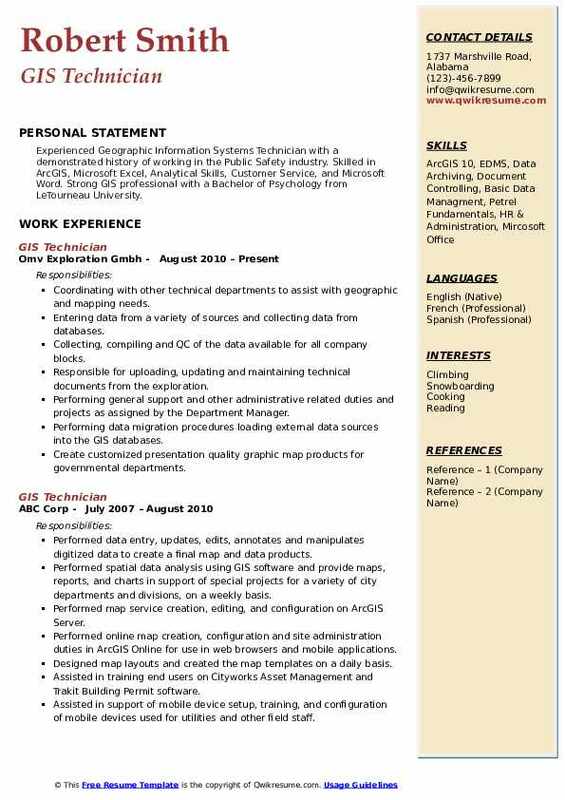 Objective : GIS Technician having been involved with data collection, wildfire analysis, and now GIS asset management in a world leading water and sewer organization, the ability to learn and adapt to new industries while applying my GIS specialties is my greatest strength. Currently, I enjoy a challenging role working with geographic information systems that enhance my knowledge of the GIS industry. Entering data into GIS databases, using techniques such as coordinate geometry, keyboard entry of tabular data, manual digitizing of maps, scanning or automatic conversion to vectors, or conversion of other sources of digital data. Converting data into GIS database with proper and accurate spatial location. Analyzed, validated and enhanced data content and assemble new content for customer applications. Digitized corrections and updates to spatial features and attributes for gas distribution service piping and equipment. Maintained and updated spatial data to ensure that regulatory reports included all pipeline segments in the required regulatory reporting areas. Updated map layers and created status reports of compliance with regulatory data. Used ArcMap geoprocessing and spatial analysis tools to create special-case maps for management evaluation of flood damage status during and hurricane recovery operations and service center area reallocation. Objective : GIS Technician, Environmental Scientist, and Quality Control (QC) Inspection professional with over 3 years of experience in the Engineering, Environmental and Geotechnical construction fields. A strong educational background in GIS, hydrology, and environmental principles with comprehensive knowledge in field data collection for asset management and evaluation, sampling for long-term environmental monitoring projects, soil properties, and construction materials evaluations. Performed field data collection and various gis tasks on stand-alone GIS projects. Provided support for large multi-discipline projects in small teams as directed by GIS Analysts and Dept. Director on federal, state, and municipal contracts. Conducted Global Positioning System (GPS) data collection, entry, and post-processing during field efforts. Provided technical support to field staff during data collection efforts when needed. Knowledge and comprehension of coordinate systems and conversion requirements. Performed geodatabase manipulation, creation, and editing of features, migration or generation of feature attribution. Performed Quality Control (QC) of data, prior to formal technical review. Obtained data through the interpretation of aerial or ortho-imagery for gis database entry. Completed internal gis requests; creation of AutoCAD files, data conversion and geo-referencing into various formats for input into gis, creating presentation maps, or researching, updating, and gathering data from various municipal sources. 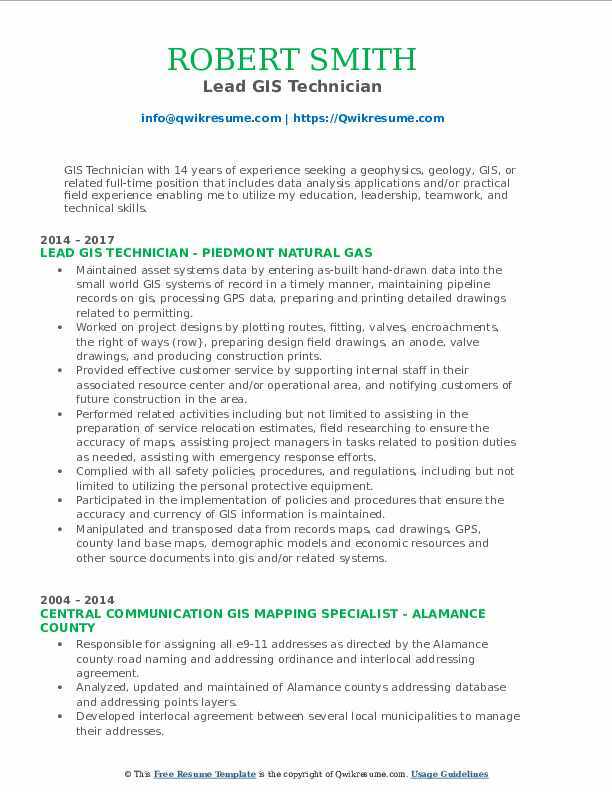 Summary : GIS Technician with 14 years of experience seeking a geophysics, geology, GIS, or related full-time position that includes data analysis applications and/or practical field experience enabling me to utilize my education, leadership, teamwork, and technical skills. Maintained asset systems data by entering as-built hand-drawn data into the small world GIS systems of record in a timely manner, maintaining pipeline records on gis, processing GPS data, preparing and printing detailed drawings related to permitting. Worked on project designs by plotting routes, fitting, valves, encroachments, the right of ways (row}, preparing design field drawings, an anode, valve drawings, and producing construction prints. Provided effective customer service by supporting internal staff in their associated resource center and/or operational area, and notifying customers of future construction in the area. Performed related activities including but not limited to assisting in the preparation of service relocation estimates, field researching to ensure the accuracy of maps, assisting project managers in tasks related to position duties as needed, assisting with emergency response efforts. Complied with all safety policies, procedures, and regulations, including but not limited to utilizing the personal protective equipment. Participated in the implementation of policies and procedures that ensure the accuracy and currency of GIS information is maintained. Manipulated and transposed data from records maps, cad drawings, GPS, county land base maps, demographic models and economic resources and other source documents into gis and/or related systems. 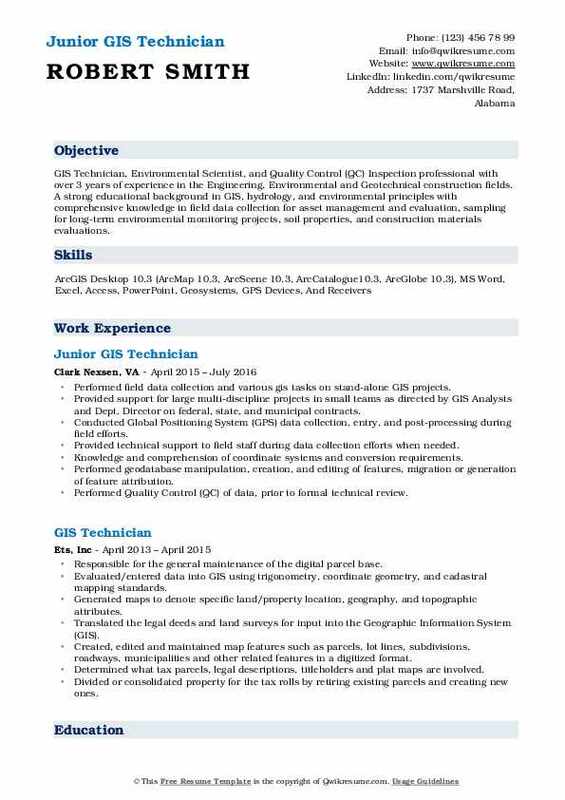 Headline : Self -directed, enthusiastic, service-focused GIS Technician seeking a position where I can utilize my Geoscience/ GIS Technologist skills to provide quality support. Expertise include: data management, mapping consisting of seismic contouring, and creation of polygons, lease line, well inventory and production data. Researching and processing the historic mining data and maps in order to create current maps and data-sets used in resource estimation. Performed data analysis of gamma logs and drill data to produce resource estimates including radii and circle-tangent area/volume calculations. Geodatabase creation and maintenance, large format scanning for georeferencing and digitizing. Create shapefiles and populate necessary metadata based on historic. Drafting, filing and managing the mining claim forms and contracts as well as state land lease documents held for mining purposes and tracking all information through associated shapefiles. Ran the GIS mapping program inputting all electrical build staking sheets, printing, correcting all maps, oversaw outage program correcting all outage errors, kept records in order for hazardous spill inspections, assisted operations supervisor with the needed report and preparing a yearly budget. Developing process workflows that increased reliability, accuracy, and consistency of routine gis processing operations. Summary : Experienced Geographic Information Systems Technician with a demonstrated history of working in the Public Safety industry. 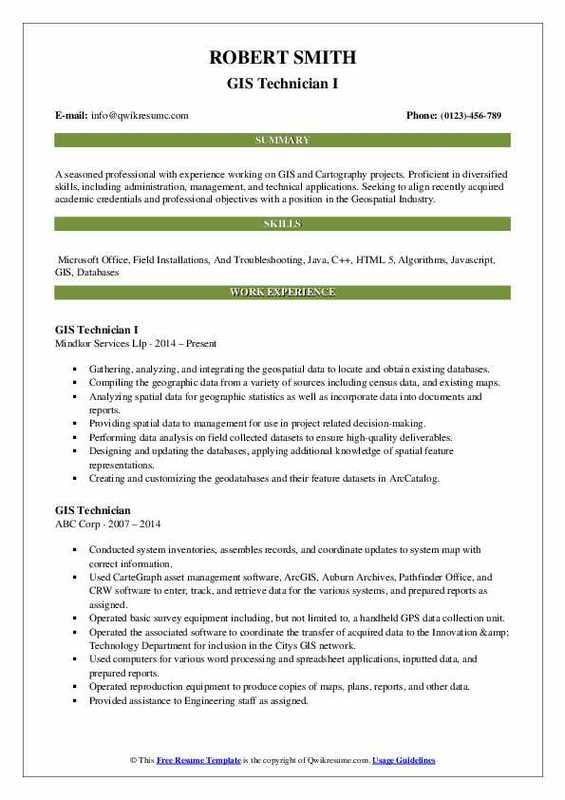 Skilled in ArcGIS, Microsoft Excel, Analytical Skills, Customer Service, and Microsoft Word. Strong GIS professional with a Bachelor of Psychology from LeTourneau University. Coordinating with other technical departments to assist with geographic and mapping needs. Entering data from a variety of sources and collecting data from databases. Collecting, compiling and QC of the data available for all company blocks. Responsible for uploading, updating and maintaining technical documents from the exploration. Performing general support and other administrative related duties and projects as assigned by the Department Manager. Performing data migration procedures loading external data sources into the GIS databases. Create customized presentation quality graphic map products for governmental departments. Responsible for the implementation of gis software automation production processes for error detection and correction. 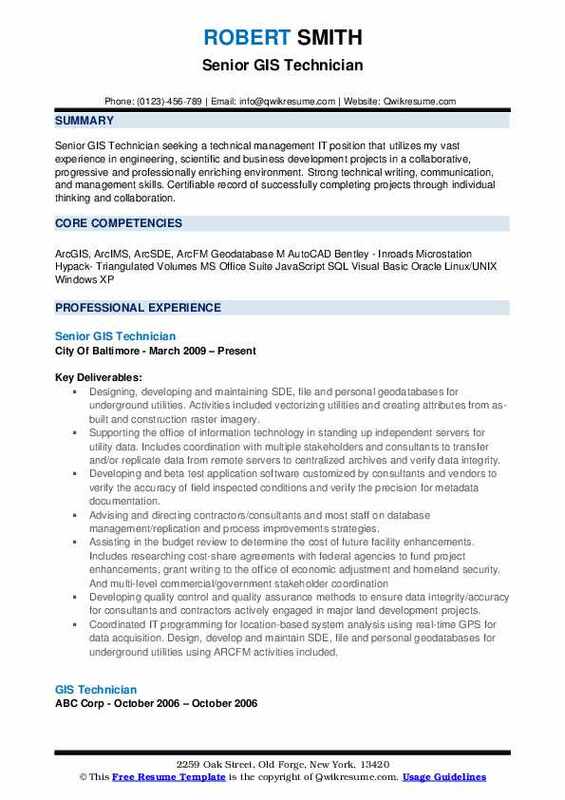 Summary : Extremely determined and passionate GIS professional with over 12 years of experience in applying GIS mapping, scripting, editing, modeling, and analysis principals. Dedicated professional with the additional experience in business administration, project management, logistics, and support. Effectively contributes towards organizational success, leads cross-functional teams with determination, thrives in demanding environments, professionally deals with increased challenges and responsibilities. 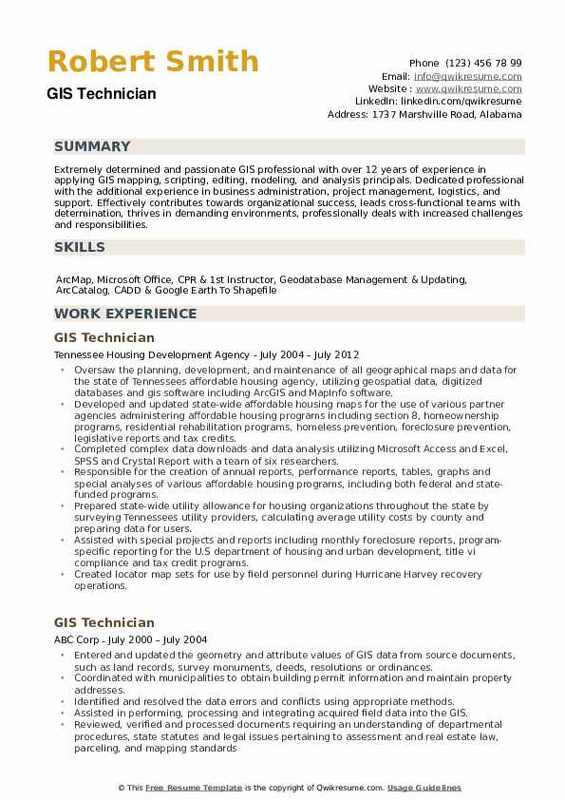 Oversaw the planning, development, and maintenance of all geographical maps and data for the state of Tennessee's affordable housing agency, utilizing geospatial data, digitized databases and gis software including ArcGIS and MapInfo software. Developed and updated state-wide affordable housing maps for the use of various partner agencies administering affordable housing programs including: section 8, homeownership programs, residential rehabilitation programs, homeless prevention, foreclosure prevention, legislative reports and tax credits. Completed complex data downloads and data analysis utilizing Microsoft Access and Excel, SPSS and Crystal Report with a team of six researchers. Responsible for the creation of annual reports, performance reports, tables, graphs and special analyses of various affordable housing programs, including both federal and state-funded programs. Prepared state-wide utility allowance for housing organizations throughout the state by surveying Tennessee's utility providers, calculating average utility costs by county and preparing data for users. Assisted with special projects and reports including monthly foreclosure reports, program-specific reporting for the U.S department of housing and urban development, title vi compliance and tax credit programs. Created locator map sets for use by field personnel during Hurricane Harvey recovery operations.